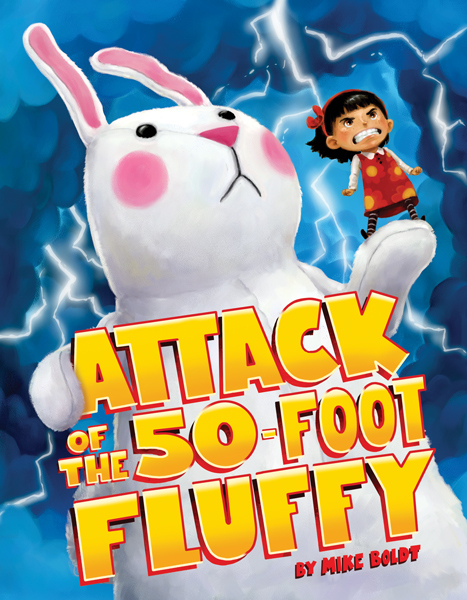 Home Uncategorized ATTACK OF THE 50 FOOT FLUFFY by Mike Boldt + Giveaway! A few years ago I had signed a two book deal with Simon & Schuster for A TIGER TAIL and a second TBT title. Long before I had finished off A TIGER TAIL I had been thinking and planning for what the second book could be, as I usually have a number of books in my imagination pipeline that I work to develop – though not all of them make it. I had been in talks with the wonderful Christian Trimmer, who acquired these books, about what the second book could be, when he was offered an amazing new position at a different publisher. While I was extremely happy for him, as he’s truly a great editor, I was also left wondering how this was going to play out not working with him anymore. It’s easy to get a bit worried about all the possible outcomes this could have, and so I was pleasantly surprised to have Ruta Rimas email me one day introducing herself as my new editor for the second book of this deal. I still remember our conversation about how she let me know the deadline for this now delayed story, and I replied that Christian and I hadn’t worked out the second idea yet. “Well, we better get going if we’re going to make that deadline then.” – Or something like that was Ruta’s response! I laughed nervously, and we set up a meeting to discuss a few of the ideas I had on the back burner. 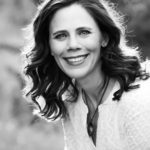 It may have sounded crazy to me, but Ruta’s calm confidence in my ability helped set me at ease. 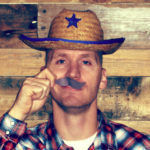 At this point I had already pitched a number of ideas to Christian that he wasn’t so sure were quite ready, so I was really starting to search through the deeper wells of my idea bank. That was when I remembered a commissioned illustration I had done for a family some time earlier. They had asked for an image of their family as some sort of classic monster movie poster. 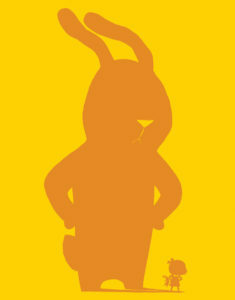 I came up with the theme based around the daughter’s stuffed bunny and The Attack of the 50 Foot Woman. I looked at my old idea and realized there may be something here and thankfully Ruta agreed! 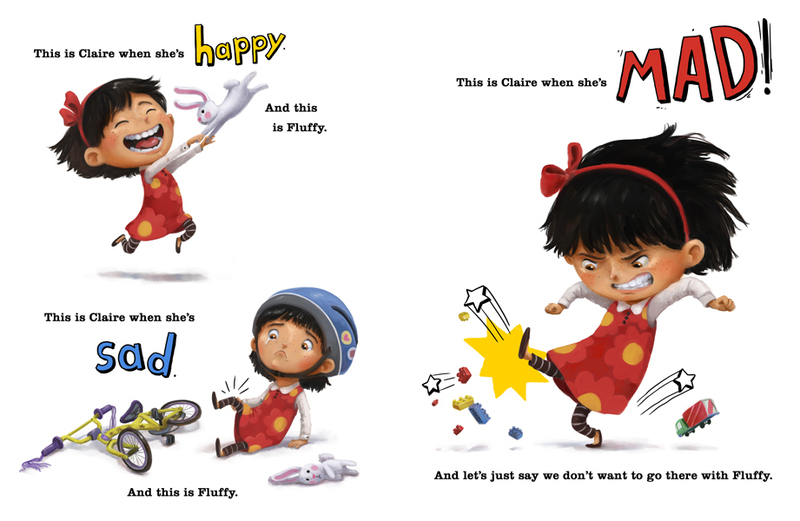 ATTACK OF THE 50 FOOT FLUFFY is now out rampaging in bookstores and story times, so I thought I’d share the first bit with you to celebrate. I think my favorite thing about this book is how it reads out loud and I hope folks enjoy it as much as I did making it. Next month I’ll return with another regular post about a book and my favorite thing about it. 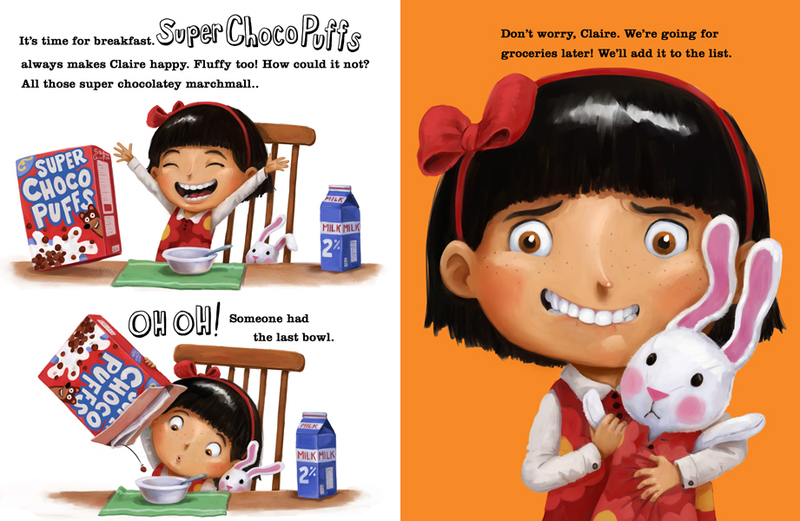 In the meantime this book came to be with the help of some really great folks – so I’ll thank Ruta, Christian, Simon and Schuster, my agent Jen, my niece Claire, and of course Tyler and Bryanne for the original commission that ignited this idea! 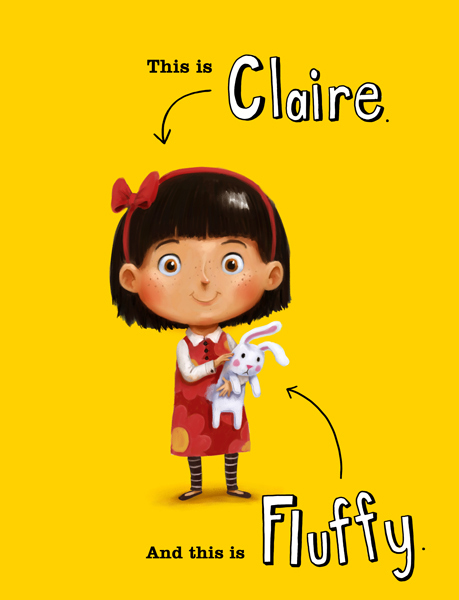 Bonus note 1: This one is dedicated to my wonderful niece Claire, who’s only real similarity with the Claire in this book is that they share the same name – I don’t know that I’ve ever seen her mad. Bonus note 2: Ruta let me do a special design for the cover under the Dust Jacket! Comment below and I’ll randomly choose a winner to receive a signed copy of ATTACK OF THE 50 FOOT FLUFFY – I’ll reveal the winner in my September post. ATTACK OF THE 50 Foot Fluffy, Christian Trimmer, Mike Boldt, picture book, Ruta Rimas, Simon and Schuster, temper tantrum. Bookmark. Love it! When my kids were little, one of my favorite books to read to them was, Sometimes I’m Bombaloo. This is my new favorite. Unfortunately, they’re all in high school now so it’s even harder to get them to sit and listen. Good luck with the book and thanks for sharing your story. Looking forward to hearing the second half. This story looks awesome! I will be on the hunt for it. 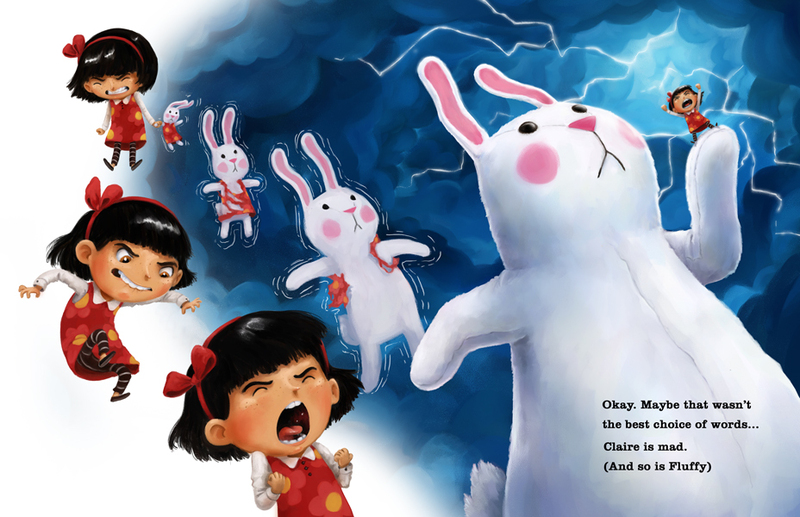 Your foreshadowing is fun for kids but also makes us curious as to what the second half of this story contains to make Bunny blow up so big! Congratulations on the new book – looking forward to reading it! This is so relatable, and I’m glad my youngest does not have a 50-foot fluffy at his disposal. Can’t wait to read it! What a fun book! The teacher brain in me is already thinking of how to use it in kindergarten! Hi Mike! I love your concept and illustrations. Clearly, you know when to break the writing rule – Don’t use helping verbs or filter words. Thanks for sharing. Yes, I need this book for one particular child in our house who shall go unnamed. Please pick me! And thanks for the background on how you arrived at this very inventive book. Congratulations! 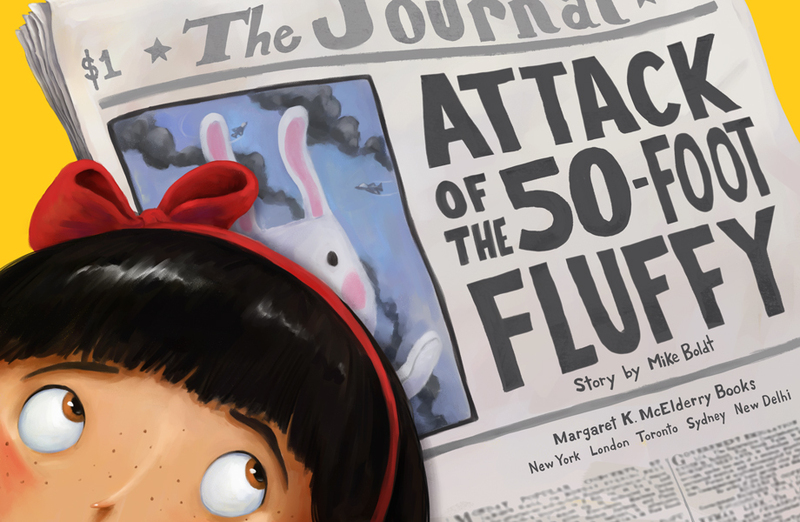 Loved hearing the backstory and am looking forward to reading Attack of the 50-Foot Fluffy! (Love that title, too!) Congratulations!! I like the title and the feeling it has twirling around on my tongue! Great concept and this shows how important it is to keep kicking around the old ideas. I love the cover and the case cover, too. Would look to win this, Mike. I need a 50-Foot Fuffy in myeline! Sounds and looks like a book that belongs in everyone’s library for just the perfect moment. Thanks! How great that your new editor was a comfortable fit. Losing an editor you’ve worked well with could have left you feeling very…very…angry. The book sounds like an absolute winner, both for kids and for the adults, who will be asked to read it again and again. We have “A Tiger Tail” (which I love!) on display with our “Going to School” books. I know your new title will really connect with the kids too and can’t wait to get it for our library! Mike, this books looks terrific! I love the progression of Claire’s facial features as she becomes more incensed! 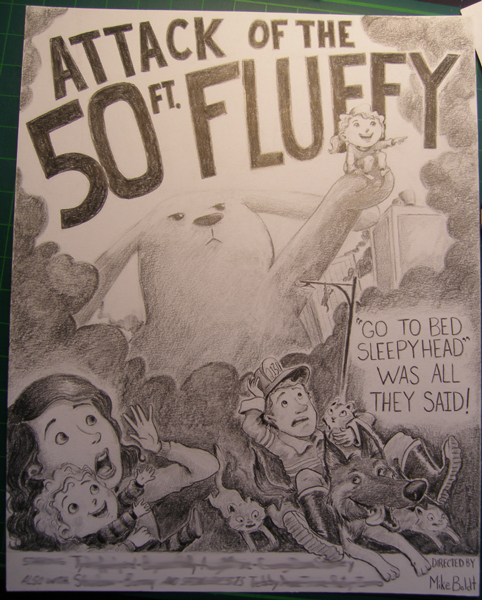 Thanks for sharing the journey of how Attack of the 50-Foot Fluffy came to be. Congrats! The pressure must of been great…but you did it in a spectacular fashion! You must have nerves of steel. This book is amazing and I can’t wait to read it for myself. 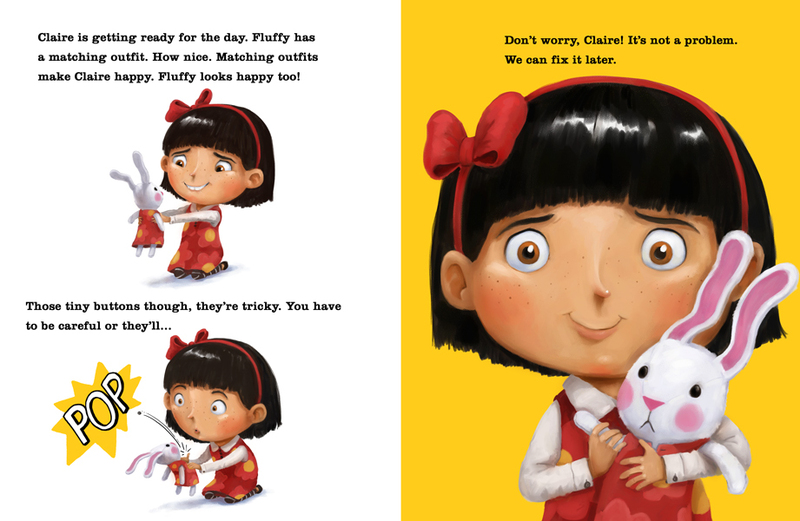 I enjoy all the emotions in the illustrations and really can feel what Claire is feeling. As a child I had a thing for bunnies, so I can’t wait to read this one. Thanks for sharing the idea development. I can’t wait to read his to my students! Love your books! Tiger Tail is my favourite school start up book. Love tiger tail! It’s my favourite school start up book. A great book for both home and school! Love it! This would be a very good book to read to my two 7 year old granddaughters. Love this book! Can’t wait to read it to my students and hear what happens when they get angry! I can see the laughter and excitement already as they explore how they will share their own stories! Such a fun book! I would love to win a copy. Thank you for sharing all of the behind the scenes. This looks adorable! I can’t wait to read it. The boys and I can’t wait to read this book! Another wonderful addition to our Boldt library! I love this! The illustrations are fantastic! This will go in my substitute bag to share with all the kiddos. Thank you! This looks really fun. Love the cover-under-the-dust-jacket too (isn’t there a name for that?) Congratulations, Mike! 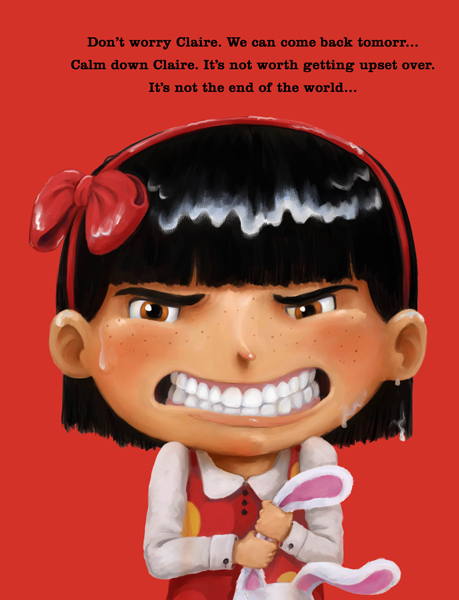 I think this book looks both entertaining and helpful to kids in expressing feelings. I have a question about the page where “marshmallows” is partially spelled out. Did you change it to “marchmallows” because it was more “kid like”? Wow! I want to meet Claire! I think kids of all ages can identify with her. I love the “surprise” covers under wraps! And the monster emotions speak to me–even as an adult. Thanks for sharing your book’s journey. Claire is so expressive! Love it! Congratulations, Mike. Congrats Mike! What a fun, creative spin off to “The Attack of the 50 Foot Woman”. Love it! I love the idea of this book. I teach pre k and I have so many ideas! Thank you Mike. Well, this looks both darling and hilarious, in true Mike Bodlt fashion. I’m super excited for it! Congratulations, Mike! This book looks hilarious! The illustrations are beautiful and I can’t wait to read it! Such great expressions and fun premise, Mike! This books looks like too much fun! Way to go, Mike! Can’t wait to read this! Love, love, love! The voice, the illustrations, and the details are all wonderful. Congratulations! Hi Mary! Happy to let you know you’re the winner of a signed copy! Please reach out to me if you don’t get an email in the next day or two! Thanks for your comment too! This looks AMAZING!!! I need to get this book asap if I don’t win it. My students will adore it! Oh my, I just have to get this book. And, not just because my name is Claire.